Detecting hazards. Protecting persons. With safety. We highlight the risks – for the public and for the individual. HÜBNER is a systems provider with tradition for the technical industry developing innovative technologies for the world market. Our expertise enables us to create innovative, intelligent products that make life simpler and safer. Every person deserves the utmost protection – especially at the workplace. Persons who work in prisons, at the customs, in the civil service, in embassies and certain enterprises are exposed to high safety risks. 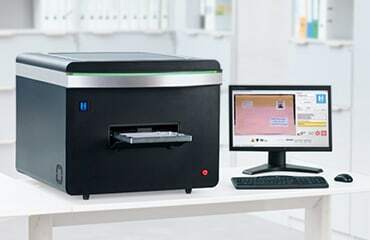 In order to minimize these risks, HÜBNER, in cooperation with the Fraunhofer Institute for High Frequency Physics and Radar Techniques has developed a new and innovative safety system: the HÜBNER Terahertz Imager T-SENSE® and the Terahertz Spectrometer T-COGNITION®. This extremely effective technological innovation is based on state-of-the-art research results. T-SENSE® detects hidden objects and materials such as drugs and explosives in letters and small parcels. Since the device is highly sensitive, it even recognizes powders and adhesives. The process is safe, fast and without risk to the health of the user. In combination with the T-COGNITION®, the material recognized in the suspicious item can also be identified. T-COGNITION® identifies threats with precision and dependability without the necessity of handling or opening the item in question. Within seconds, T-COGNITION® identifies the spectroscopic fingerprint of the hazardous substance or material by comparing the data with its own database. This system enhances work safety in prisons, at custom controls, at authorities, in companies and embassies, to name but a few. Unlike conventional visualizing processes such as x-ray technology, the T-SENSE® functions on the lower Terahertz frequency level with safe millimeter waves that enable non-transparent materials to be illuminated.